African Buns is the closest sibling to the African Puff Puff. It is basically a fried dough or let’s say more of a thick batter without yeast. These delicious Nigerian Buns are crunchy on the outside and soft on the inside. Buns are extremely popular roadside snacks all over Nigeria. They are usually sold as snacks and they are often seen on the roadside being fried in a large fry pan also, they are being sold by a hawker or vendor from a portable stall. The Nigerian Buns are eaten mainly as a snack but they can also be eaten as breakfast served with tea. 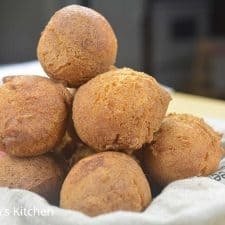 Though these Buns are deep fried just like the African Puff Puffthey do not absorb as much Oil as the Puff puff and the best part is, you can throw all the ingredients together and your Buns is ready in less than 30 minutes. These are so delicious when served hot or at room temperature. These snacks would be great for a party, side dish for a meal, a snack… just about anytime you want! These delicious African Buns are crunchy on the outside and soft on the inside. I think a trial will definitely convince you. 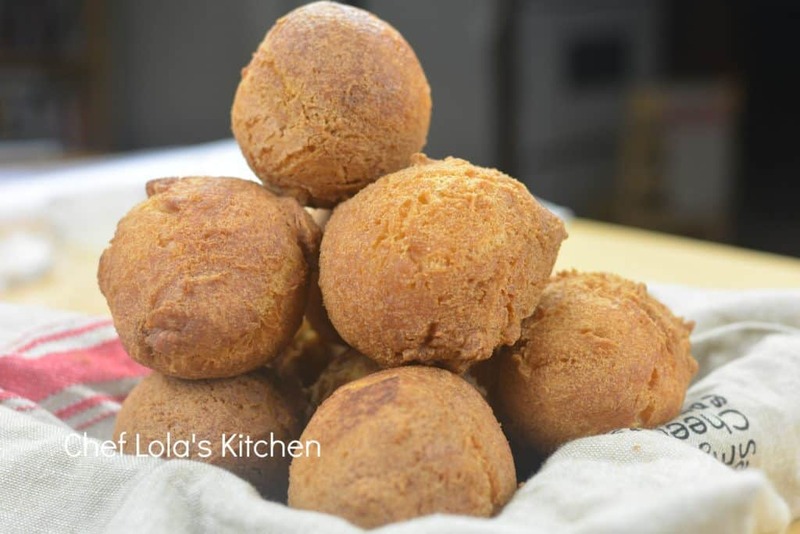 Though these Buns are deeply fried just like the Puff puff but they do not absorb as much Oil as the Puff puff and the best part is, you can throw all the ingredients together and your Buns is ready in less than 30 minutes. Mix the Flour, Sugar, Baking powder and Salt together in a bowl. Scoop the Batter into the Oil (Make little Balls) - I used an Ice cream scoop. Fry until golden Brown and ENJOY. I tried it out,and it was soooooo nice and round. Thanks,and I always love your recipes. Thanks for the feedback Patience. I’m glad it turned out well for you. I love your recipes and all the onces I have tried came out really well,they are quite clear and easy to follow. hi please can one add yeast in egg roll. Personally, I don’t add yeast to my Egg rollsi because the original recipe does not call for yeast. However, I have heard some cases of people who had success adding Yeast. You can give it a try though. Yes, Oil will work however, there will be a slight difference in texture. You didn’t mention butter in the preparation. Sorry that was an oversight, I have made the necessary adjustments. Thanks for pointing it out. I love your recipe. I tried making it but it was not round like yours, it was flat. Where could I have gone wrong? What could have caused that? Kindly help out because I want to try it again and I want to get it right this time. Buns is a snack I love so much. Hi Tosin, I’m sorry to hear that. Did you add baking powder? and I hope the batter was not too watery as well? These are the things I think could be cause.Please let me know if that helps. Thanks a lot. I used baking powder but maybe maybe the batter was not thick enough. I will try again with a thicker batter and let you know the outcome. I appreciate. I love your recipes ; nice and clear.